Get Listed with the Turbomachinery International Handbook! To get started, please enter your full name, email address and password. This creates your free Handbook Listing account. Getting listed is easy! Continue reading for details. Free Company Listing information fields are indicated by this grey box. If you complete the application with only Free fields submitted, it will be considered a FREE LISTING. Free qualified listings are NOT guaranteed to be published in the Print Handbook due to space limitations, but will be published in the Online Handbook. 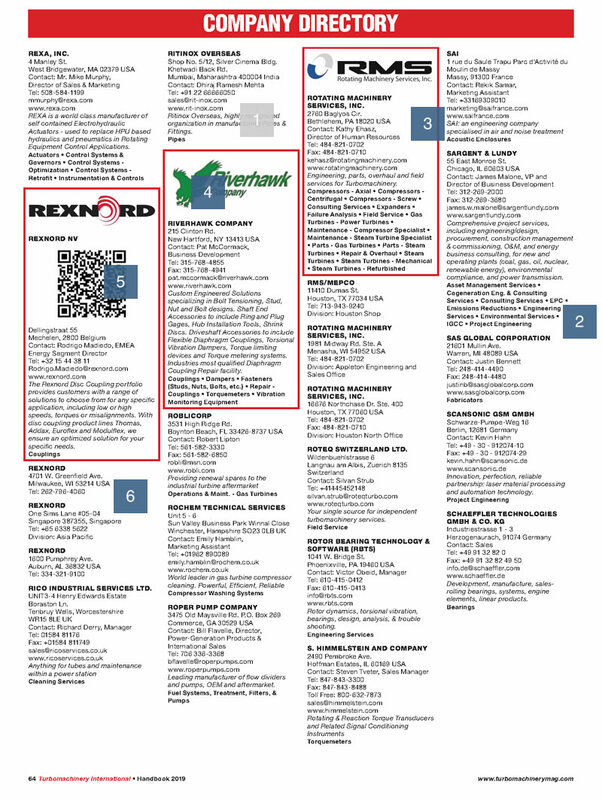 Example above shows a typical free listing in print. Enhanced Company Listing fields are indicated by this dark-blue box. If you complete this form and purchase any of these fields, it will be considered an ENHANCED LISTING. How Do I Enhance My Listing? Enhanced Listings are GUARANTEED to appear in the Print Edition of the Handbook. Enhanced Listings are designed to 'stand out' among the Free Online Listings.